This conflict is being fueled by many factors, including economic disparities between the two Sudans and an abiding animosity between the southerners (who are mostly black Africans and Christians or animists) and the northerners (mostly Arabs and Muslims). But oil - and the revenues produced by oil - remains at the heart of the matter. When Sudan was divided in 2011, the most prolific oil fields wound up in the south, while the only pipeline capable of transporting the south's oil to international markets (and thus generating revenue) remained in the hands of the northerners. They have been demanding exceptionally high "transit fees" - $32-$36 per barrel compared to the common rate of $1 per barrel - for the privilege of bringing the South's oil to market. When the southerners refused to accept such rates, the northerners confiscated money they had already collected from the south's oil exports, its only significant source of funds. In response, the southerners stopped producing oil altogether and, it appears, launched their military action against the north. The situation remains explosive. Naval clash in the South China Sea: On April 7th, a Philippine naval warship, the 378-foot Gregorio del Pilar, arrived at Scarborough Shoal, a small island in the South China Sea, and detained eight Chinese fishing boats anchored there, accusing them of illegal fishing activities in Filipino sovereign waters. China promptly sent two naval vessels of its own to the area, claiming that the Gregorio del Pilar was harassing Chinese ships in Chinese, not Filipino waters. The fishing boats were eventually allowed to depart without further incident and tensions have eased somewhat. However, neither side has displayed any inclination to surrender its claim to the island and both sides continue to deploy warships in the contested area. As in Sudan, multiple factors are driving this clash, but energy is the dominant motive. The South China Sea is thought to harbor large deposits of oil and natural gas, and all the countries that encircle it, including China and the Philippines, want to exploit these reserves. Manila claims a 200-nautical mile "exclusive economic zone" stretching into the South China Sea from its western shores, an area it calls the West Philippine Sea; Filipino companies say they have found large natural gas reserves in this area and have announced plans to begin exploiting them. Claiming the many small islands that dot the South China Sea (including Scarborough Shoal) as its own, Beijing has asserted sovereignty over the entire region, including the waters claimed by Manila; it, too, has announced plans to drill in the area. Despite years of talks, no solution has yet been found to the dispute and further clashes are likely. Egypt cuts off the natural gas flow to Israel: On April 22nd, the Egyptian General Petroleum Corporation and Egyptian Natural Gas Holding Company informed Israeli energy officials that they were "terminating the gas and purchase agreement" under which Egypt had been supplying gas to Israel. This followed months of demonstrations in Cairo by the youthful protestors who succeeded in deposing autocrat Hosni Mubarak and are now seeking a more independent Egyptian foreign policy - one less beholden to the United States and Israel. It also followed scores of attacks on the pipelines carrying the gas across the Negev Desert to Israel, which the Egyptian military has seemed powerless to prevent. Ostensibly, the decision was taken in response to a dispute over Israeli payments for Egyptian gas, but all parties involved have interpreted it as part of a drive by Egypt's new government to demonstrate greater distance from the ousted Mubarak regime and his (U.S.-encouraged) policy of cooperation with Israel. The Egyptian-Israeli gas link was one of the most significant outcomes of the 1979 peace treaty between the two countries, and its annulment clearly signals a period of greater discord; it may also cause energy shortages in Israel, especially during peak summer demand periods. On a larger scale, the cutoff suggests a new inclination to use energy (or its denial) as a form of political warfare and coercion. Argentina seizes YPF: On April 16th, Argentina's president, Cristina Fernández de Kirchner, announced that her government would seize a majority stake in YPF, the nation's largest oil company. Under President Kirchner's plans, which she detailed on national television, the government would take a 51% controlling stake in YPF, which is now majority-owned by Spain's largest corporation, the energy firm Repsol YPF. The seizure of its Argentinean subsidiary is seen in Madrid (and other European capitals) as a major threat that must now be combated. Spain's foreign minister, José Manuel García Margallo, said that Kirchner's move "broke the climate of cordiality and friendship that presided over relations between Spain and Argentina." Several days later, in what is reported to be only the first of several retaliatory steps, Spain announced that it would stop importing biofuels from Argentina, its principal supplier - a trade worth nearly $1 billion a year to the Argentineans. As in the other conflicts, this clash is driven by many urges, including a powerful strain of nationalism stretching back to the Peronist era, along with Kirchner's apparent desire to boost her standing in the polls. Just as important, however, is Argentina's urge to derive greater economic and political benefit from its energy reserves, which include the world's third-largest deposits of shale gas. While long-term rival Brazil is gaining immense power and prestige from the development of its offshore "pre-salt" petroleum reserves, Argentina has seen its energy production languish. Repsol may not be to blame for this, but many Argentineans evidently believe that, with YPF under government control, it will now be possible to accelerate development of the country's energy endowment, possibly in collaboration with a more aggressive foreign partner like BP or ExxonMobil. Argentina re-ignites the Falklands crisis: At an April 15th-16th Summit of the Americas in Cartagena, Colombia - the one at which U.S. Secret Service agents were caught fraternizing with prostitutes - Argentina sought fresh hemispheric condemnation of Britain's continued occupation of the Falkland Islands (called Las Malvinas by the Argentineans). It won strong support from every country present save (predictably) Canada and the United States. Argentina, which says the islands are part of its sovereign territory, has been raising this issue ever since it lost a war over the Falklands in 1982, but has recently stepped up its campaign on several fronts - denouncing London in numerous international venues and preventing British cruise ships that visit the Falklands from docking in Argentinean harbors. The British have responded by beefing up their military forces in the region and warning the Argentineans to avoid any rash moves. When Argentina and the U.K. fought their war over the Falklands, little was at stake save national pride, the stature of the country's respective leaders (Prime Minister Margaret Thatcher vs. an unpopular military junta), and a few sparsely populated islands. Since then, the stakes have risen immeasurably as a result of recent seismic surveys of the waters surrounding the islands that indicated the existence of massive deposits of oil and natural gas. Several UK-based energy firms, including Desire Petroleum and Rockhopper Exploration, have begun off-shore drilling in the area and have reported promising discoveries. Desperate to duplicate Brazil's success in the development of offshore oil and gas, Argentina claims the discoveries lie in its sovereign territory and that the drilling there is illegal; the British, of course, insist that it's their territory. No one knows how this simmering potential crisis will unfold, but a replay of the 1982 war - this time over energy - is hardly out of the question. 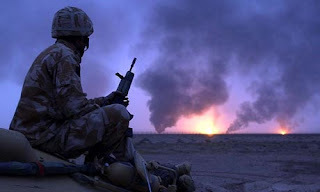 U.S. forces mobilize for war with Iran: Throughout the winter and early spring, it appeared that an armed clash of some sort pitting Iran against Israel and/or the United States was almost inevitable. Neither side seemed prepared to back down on key demands, especially on Iran's nuclear program, and any talk of a compromise solution was deemed unrealistic. Today, however, the risk of war has diminished somewhat - at least through this election year in the U.S. - as talks have finally gotten under way between the major powers and Iran, and as both have adopted (slightly) more accommodating stances. In addition, U.S. officials have been tamping down war talk and figures in the Israeli military and intelligence communities have spoken out against rash military actions. However, the Iranians continue to enrich uranium, and leaders on all sides say they are fully prepared to employ force if the peace talks fail. For the Iranians, this means blocking the Strait of Hormuz, the narrow channel through which one-third of the world's tradable oil passes every day. The U.S., for its part, has insisted that it will keep the Strait open and, if necessary, eliminate Iranian nuclear capabilities. Whether to intimidate Iran, prepare for the real thing, or possibly both, the U.S. has been building up its military capabilities in the Persian Gulf area, deploying two aircraft carrier battle groups in the neighborhood along with an assortment of air and amphibious-assault capabilities. One can debate the extent to which Washington's long-running feud with Iran is driven by oil, but there is no question that the current crisis bears heavily on global oil supply prospects, both through Iran's threats to close the Strait of Hormuz in retaliation for forthcoming sanctions on Iranian oil exports, and the likelihood that any air strikes on Iranian nuclear facilities will lead to the same thing. Either way, the U.S. military would undoubtedly assume the lead role in destroying Iranian military capabilities and restoring oil traffic through the Strait of Hormuz. This is the energy-driven crisis that just won't go away. All of these disputes have one thing in common: the conviction of ruling elites around the world that the possession of energy assets - especially oil and gas deposits - is essential to prop up national wealth, power, and prestige. This is hardly a new phenomenon. Early in the last century, Winston Churchill was perhaps the first prominent leader to appreciate the strategic importance of oil. As First Lord of the Admiralty, he converted British warships from coal to oil and then persuaded the cabinet to nationalize the Anglo-Persian Oil Company, the forerunner of British Petroleum (now BP). The pursuit of energy supplies for both industry and war-fighting played a major role in the diplomacy of the period between the World Wars, as well as in the strategic planning of the Axis powers during World War II. It also explains America's long-term drive to remain the dominant power in the Persian Gulf that culminated in the first Gulf War of 1990-91 and its inevitable sequel, the 2003 invasion of Iraq. But that energy equation is changing ominously as the challenge of fueling the planet grows more difficult. Many of the giant oil and gas fields that quenched the world's energy thirst in years past are being depleted at a rapid pace. The new fields being brought on line to take their place are, on average, smaller and harder to exploit. Many of the most promising new sources of energy - like Brazil's "pre-salt" petroleum reserves deep beneath the Atlantic Ocean, Canadian tar sands, and American shale gas - require the utilization of sophisticated and costly technologies. Though global energy supplies are continuing to grow, they are doing so at a slower pace than in the past and are continually falling short of demand. All this adds to the upward pressure on prices, causing anxiety among countries lacking adequate domestic reserves (and joy among those with an abundance). The world has long been bifurcated between energy-surplus and energy-deficit states, with the former deriving enormous political and economic advantages from their privileged condition and the latter struggling mightily to escape their subordinate position. Now, that bifurcation is looking more like a chasm. In such a global environment, friction and conflict over oil and gas reserves - leading to energy conflicts of all sorts - is only likely to increase. Looking, again, at April's six energy disputes, one can see clear evidence of these underlying forces in every case. South Sudan is desperate to sell its oil in order to acquire the income needed to kick-start its economy; Sudan, on the other hand, resents the loss of oil revenues it controlled when the nation was still united, and appears no less determined to keep as much of the South's oil money as it can for itself. China and the Philippines both want the right to develop oil and gas reserves in the South China Sea, and even if the deposits around Scarborough Shoal prove meager, China is unwilling to back down in any localized dispute that might undermine its claim to sovereignty over the entire region. Egypt, although not a major energy producer, clearly seeks to employ its oil and gas supplies for maximum political and economic advantage - an approach sure to be copied by other small and mid-sized suppliers. Israel, heavily dependent on imports for its energy, must now turn elsewhere for vital supplies or accelerate the development of disputed, newly discovered offshore gas fields, a move that could provoke fresh conflict with Lebanon, which says they lie in its own territorial waters. And Argentina, jealous of Brazil's growing clout, appears determined to extract greater advantage from its own energy resources, even if this means inflaming tensions with Spain and Great Britain. And these are just some of the countries involved in significant disputes over energy. Any clash with Iran - whatever the motivation - is bound to jeopardize the petroleum supply of every oil-importing country, sparking a major international crisis with unforeseeable consequences. China's determination to control its offshore hydrocarbon reserves has pushed it into conflict with other countries with offshore claims in the South China Sea, and into a similar dispute with Japan in the East China Sea. Energy-related disputes of this sort can also be found in the Caspian Sea and in globally warming, increasingly ice-free Arctic regions. The seeds of energy conflicts and war sprouting in so many places simultaneously suggest that we are entering a new period in which key state actors will be more inclined to employ force - or the threat of force - to gain control over valuable deposits of oil and natural gas. In other words, we're now on a planet heading into energy overdrive. On April 10th, forces from the newly independent state of South Sudan occupied the oil center of Heglig, a town granted to Sudan as part of a peace settlement that allowed the southerners to secede in 2011. The northerners, based in Khartoum, then mobilized their own forces and drove the South Sudanese out of Heglig. Fighting has since erupted all along the contested border between the two countries, accompanied by air strikes on towns in South Sudan. Although the fighting has not yet reached the level of a full-scale war, international efforts to negotiate a cease-fire and a peaceful resolution to the dispute have yet to meet with success.